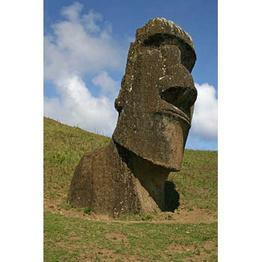 An award of over £640,000 has been made by the Arts and Humanities Research Council (AHRC) for a new phase of the project 'Rapa Nui (Easter Island) Landscapes of Construction'. Professor Sue Hamilton (UCL Institute of Archaeology) is Principal Investigator, with Colin Richards (University of Manchester) and Kate Welham (Bournemouth University) as Co-Investigators, and the Orkney Research Centre for Archaeology (ORCA), University of Highlands and Islands as project partner. The AHRC described the Rapa Nui project as "an outstanding proposal, meeting world-class standards of scholarship, originality, quality and significance". The most prominent archaeological features of Rapa Nui (Easter Island) are the colossal stone statues ('moai') dating between c.AD 1000 to AD 1600 that once stood on stone ceremonial platforms ('ahu') positioned around the coastline of the island. The project aims to develop new interpretations on the organisation and meaning of these monumental construction activities and to unify the previously isolated research focuses of statue quarries, transport roads, and ahu, into an integrated island-wide programme of landscape study, survey and excavation. This is a new phase of the project 'Rapa Nui Landscapes of Construction', which is directed by Sue Hamilton and Colin Richards and is a collaborative venture between UCL and the University of Manchester, Bournemouth University, ORCA, the University of Chile, Santiago, the Rapa Nui National Parks (CONAF), and the Island's Museum (MAPSE). Its degree programmes offer an unrivalled variety of course options, covering a diverse array of archaeological topics, and wide-ranging fieldwork opportunities. The institute hosts numerous events on many different aspects of archaeology and is linked to many other heritage institutions, archaeological societies and organisations, providing an outstanding research environment for staff, students and visitors.